Most of my items are used and sold as is. They may only be returned if I have made a significant error in describing them. 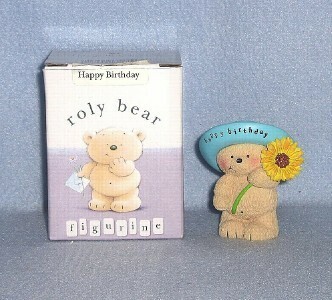 Hallmark Cards PLC - Roly Bear - Happy Birthday Figurine Blushing Light Brown Teddy Bear wearing a Blue Hat that says "Happy Birthday" and holding a Sunflower. 1 Figurine 2 3/8" tall and about 2 1/8" wide. Excellent condition with no chips, marks, stains, scratches or crazing. Includes original box with foam insert and plastic wrapper. Foam insert cover is broken from clumsy opening, but it holds the figurine in place. Package Weight: 0 lbs 6 oz. Be sure to check out my shipping policies for more information about services used and both domestic and international rates. 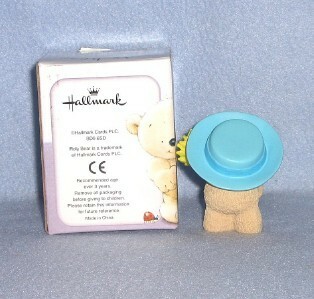 Visit my booth for China, Stoneware, Glassware, Collectables, Books, Patterns, kits and More.